Golden cohort of Old Stortfordians! 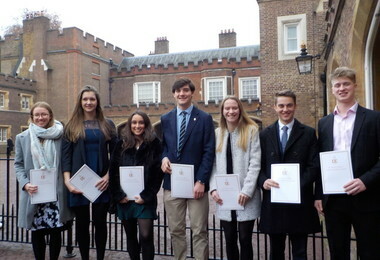 The College is very proud of the outstanding achievement of a growing number of Old Stortfordians who have achieved the top accolade in the Duke of Edinburgh’s Award. Dedication and commitment have seen a golden cohort of OS secure this coveted award over the past year. This group undertook a very varied range of activities to meet the stringent criteria to complete the awards, from working in an elephant sanctuary to attending cookery courses, working with the charity Inspire Malawi, volunteering in local charity shops, going on adventure courses helping at Pre-Prep, fundraising for charity, drama courses, working with animals, music lessons and numerous sports including boxing, rugby, hockey, swimming and netball. Huge congratulations is shared with the following 27 Old Stortfordians whom we hope will build upon the skills they have honed during the Duke of Edinburgh programme to bring themselves continued success in their adventures after the College.